In the last ten years, NAMA has set out to tackle the challenges of marine conservation in a way many fisheries organizations haven’t - through changing our food system. We believe that bringing about a more just, equitable, and sustainable food system will result in the positive changes we’re calling for in our mission and values. This includes improving the livelihoods of fishermen through economic empowerment, creating a healthier marine ecosystem, and stopping the corporate takeover of both the ocean and our food. The problems we’re facing are large: fishermen are not making enough money to pay their bills; seafood travels thousands of miles from where it’s harvested to where it’s consumed with little transparency along the way; and large outside investors are usurping rights from community-based fishermen. These issues play out, and are amplified, in our food system. When we talk about the ‘food system’ we’re referring to the network of people who grow, harvest, produce and eat food, and all the regulations that govern each step of that process. We’re all part of a food system whether we’re considering the local, regional, or global scale. Seafood harvesters aren’t being afforded lives with dignity because they don’t earn a fair wage for their catch. They are feeding the world and at the same time, struggling to feed their families. There is little transparency in how seafood gets from the ocean to the consumer. We’re more disconnected than ever to what we’re feeding ourselves and our families. When In situations where consumers do have access to the traceability information about the seafood and the fishermen have received a fair price for their catch, the product is often priced out of accessibility for working class people. Human rights abuses are rampant in our food system - from unjust working conditions and slave labor in fisheries to farmworker’s being treated unfairly in the field. The planet is suffering - factory-fishing and industrial fish farms are polluting our water and land. Most often, this destruction is by the hands (hah, as if corporations were people) of massive corporations who are only interested in profit. For these reasons, it’s time to change how our food system operates. We need to demand a food system that stops extracting wealth and well-being from our communities, and shift toward one that prioritizes food producers, communities, consumers, and the planet. That’s why we’re engaged in the Real Meals Campaign - a campaign that is setting out to do just that. The problem is that these three companies purchase the vast majority of their food from multinational corporations and large-scale manufacturers like Bumble Bee and Tyson. We’re calling on them to support our communities, not Big Food. For context, the largest of them, Compass Group, earns over $20 billion each year in global revenue. That’s almost as big as McDonald’s globally. So imagine how much buying power they have and how that could be shifted to being a force for good. The Real Meals Campaign is specifically confronting these three companies in colleges and universities. At these institutions, we’re able to leverage the power of student organizers who are ready and willing to take on these corporations and demand a change to the food they are being served, and by extension, our food system. Transforming our food system is not something that can be done quickly or simply. Ten years ago we helped develop the Community Supported Fishery model and a network to connect those folks around their shared goals for seafood. From there, we set out to change institutional purchasing policies because we saw them as important levers to shift something bigger, a way to knock over that first domino toward systemic change. This is yet another progression in our strategy for achieving food justice--instead of focusing on individual institutions, we want to shift the practices of the large corporations that serve food at thousands of institutions. 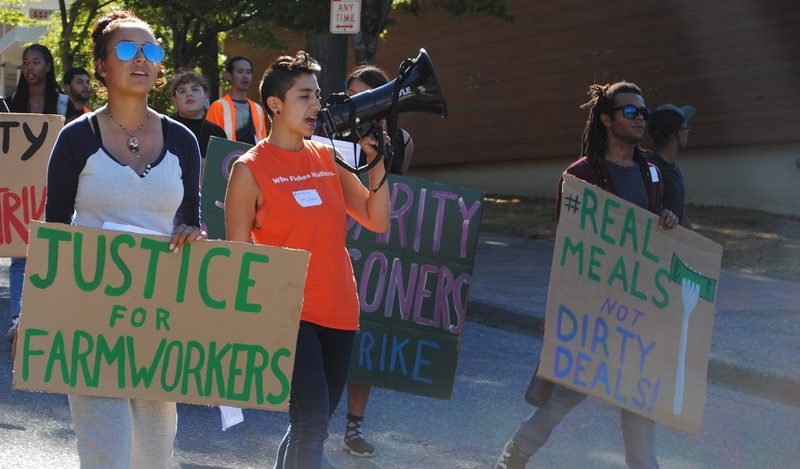 That’s why we’ve outlined a set of demands aimed at these three companies - Aramark, Sodexo, and Compass Group. For seafood, we are calling for five percent of seafood at each of the three companies to be sourced from owner-operated boats and for all production, processing, and distribution to be within a 500-mile radius of the institution in which it is being consumed. While this is an imperfect calculation for supporting community-based fishermen, we’re hopeful it will bring us closer to the kind of food system that fishermen and marine ecosystems need to survive and thrive. More broadly, the campaign is asking these corporations to purchase more food that is ecologically sound, fair, humane, local and community-based. We’re asking that they increase racial justice and equity by increasing purchasing from historically underserved producers. And finally that they do their part in fighting climate change by reducing carbon emissions and factory-farmed meat purchases. This campaign cannot be won without the support and participation of all of us. We need to build power to demonstrate to these companies that they have no choice but to conform to our demands. Attend a regional training or community dinner, time and locations below. Email Julianna@namanet.org if you are interested in attending! Email Julianna@namanet.org to learn more! This post comes from Brett Tolley, NAMA's National Program Coordinator. See our additional statement to the press. 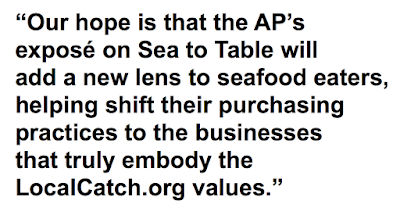 A recent Associated Press (AP) report accused national distributor Sea to Table of seafood fraud, causing many of us in the values-based seafood community to ask deep questions. On the heels of the report's release, four ex-employees came forward revealing how they raised internal concerns to Sea to Table's leadership that were then either silenced or swept under the rug. Sea to Table CEO, Sean Dimin, responded that the AP got it wrong, the ex-employees statements were false, and said, "the bottom line here is we may have been misled by one of our trusted suppliers." For us at NAMA, in order to better understand this situation and its implications to our movement, we set out to talk to as many parties involved as possible. From those conversations, we learned that the bottom line is that Sea to Table demonstrated a significant lack of judgment in who they trusted and they dismissed early warning signs that should have triggered course correction. As a business committed to positive change in the seafood industry, they should have done better. To the four ex-employees, thank you for speaking up. We know how much courage it takes to speak out as we've worked directly with many fishermen over the years who blew the whistle on those with power. In many instances the truths these fishermen brought forth were dismissed. In addition, they have been ridiculed, silenced at public meetings, bullied on the ocean, or threatened at their doorstep. We take your input very seriously and will continue our due diligence to understand what happened. On a personal level, I know Sea to Table. They have bought fish that was caught by my family. For years I lived down the block from their original headquarters in Brooklyn and have known the co-founder, Michael Dimin, since Sea to Table began. Sean Dimin and I have spoken at events together and Sea to Table is connected through many of our networks, aligning themselves around a shared vision toward good, clean, and fair seafood. Sea to Table misplaced their trust. 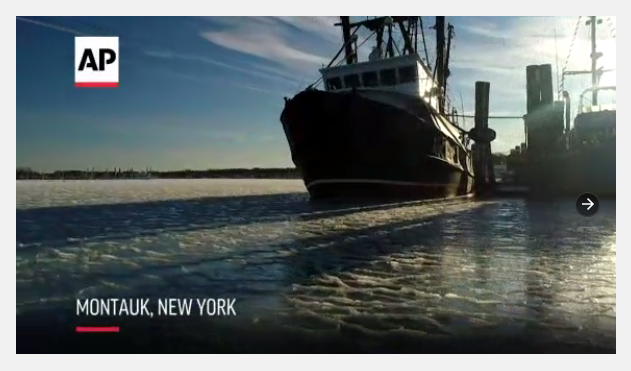 Sea to Table trusted their New York-based seafood supplier Gosman's Fish Market. We know Gosman's too. 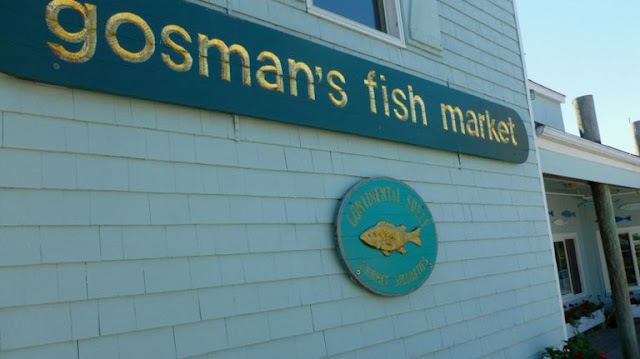 Local fishermen have walked us through Gosman's retail seafood display and pointed out mislabeled fish that couldn't possibly be 'local' but rather came from the world's second largest seafood wholesaler, Fulton Street Fish Market. Read about Fulton Fish Market co-opting the term Community Supported Fisheries and a sign-on letter from 76 businesses across the country. So it was no surprise when the AP revealed how Gosman's delivered 'Montauk' fish to Sea to Table that wasn't seasonal to Montauk and caught by a fisherman who wasn't bringing fish to Montauk docks. If Sea to Table executives knew anything about the waters off Long Island or anything about the local fishermen, they would have known there was a problem long before ex-employees and the AP investigation brought this to light. We believe the Dimin family created Sea to Table with the best of intentions. However, they have minimal boots-on-deck experience and a short history for knowing how working waterfronts operate. Sea to Table asks the public to "know your fisherman" yet they don't really know their fishermen. What concerns us is that if Sea to Table trusted the wrong supplier who operates in their own backyard, how can the public trust Sea to Table's judgment with any of their other suppliers? Trust is extremely fragile in the seafood industry and yet of utmost importance. Lucid trust, not blind trust. Conservation-minded family fishermen, who have been publicly and often wrongly demonized for years, have had to work hard to regain public trust. Sea to Table had the responsibility to ensure their supply chain aligned with their values and should have worked harder at building their chain of trust. Now they will have to work even harder to regain the public's trust. Former Sea to Table employees and fishermen flagged early warning signs that should have caused Sea to Table to alter course. Their marketing materials contained information about fishing gear that didn't always match up with the correct boat, boat names didn't always match up with the fish, and fish didn't always match up with the season. For most seafood dealers this is par for the course. But businesses like Sea to Table, who have a supply-based business model, depend on seafood sales being driven by local fishermen's catch, the story of the fishermen, and the seasonality of what is abundant in nearby waters. As Sea to Table increased sales and expanded geographical reach the warning signs should have caused a moment of reflection. As one ex-employee put it, "The reality is that you cannot create this supply-based model on a national scale unless you are trying to change the buying habits of your customers. And Sea to Table wasn't willing to do that." Sean Dimin told the AP, "It's a very unfortunate case of killing the good because everything is not yet perfect." But dismissing feedback from employees and fishermen is not good. Nor is putting trust in a seafood supplier whose practices were being called into question by many within Sea to Table's own community. In 2009 Cape Ann Fresh Catch was among the first to pilot the Community Supported Fisheries (CSF) model. Around the country, increased seafood fraud is giving rise to alternative solutions. Over a decade ago one those solutions emerged from the Port Clyde fishing community, which together with NAMA piloted the first ever "Community Supported Fishery", taking its cue from the land-based "Community Supported Agriculture" (CSA) model. Since then hundreds of other Community Supported Fisheries and values-based seafood businesses have popped up around the country and around the globe. We've been honored to work with several of those communities to create these new models and the many machinations that have emerged since. That's why we take this case very seriously and any others that compromise the intent and values that birthed the first CSF and the new seafood movement. Much like those whistleblowers, we consider it our obligation to speak up. Since those early days, LocalCatch.org has emerged to provide a platform for this growing seafood community and is now the go-to hub for connecting and aligning seafood businesses, organizations, researchers and eaters around shared values, and re-imagining what the seafood supply chain could look like. All this momentum and more helped pave the way for values-driven seafood businesses to thrive, including Sea to Table. To start taking leadership for the collective movement, the LocalCatch.org network created a baseline set of values in 2016 to guide the seafood revolution (or, 'revolocean' as coined by fisherman Aaron Longton) that we would embody to help transform the seafood industry. Our seafood community has a responsibility to protect these values and provide support to businesses seeking to align around our shared vision. Some of these core values include fair price, transparency, and eating in line with the ecosystem's rhythms. Embedded in these values is the concept that the public demand for seafood shouldn't dictate the supply chain. Rather, our eating patterns should align with the bounty of the ocean, community-based fishing, and much more. But too commonly, we see seafood suppliers striving to fill orders that are misaligned with what local fishermen are catching. Rather than say "no, our fishermen are not catching this right now", they attempt to fill the order gap through the global commodities market that is fraught with mislabeling and labor exploitation. Our values along with those of the founding CSA and CSF models, however, compel us to educate eaters to 'eat with the ecosystem' and also share the risks with the fishermen. One way of sharing those risks is through eating outside of our comfort zone and embracing what is abundant in our nearby waters. Ultimately, as we've learned from other movements, we know that many of the systems we put in place will be manipulated by others for their own gain. This means we must work even harder to protect the values we stand for and create a diligent network whose members will be accountable to themselves and each other. As part of the LocalCatch.org network, we've begun to operationalize the Core Values. The LocalCatch.org website now prominently features seafood companies and the values on which their practices are based so the public can make smarter choices in their seafood sourcing. In addition, LocalCatch.org and leaders within sister networks such as Slow Fish are beginning to consider 'community accountability' models that would continue to enhance trust and transparency in seafood. In many ways, the fishermen and ex-employees who raised concerns to Sea to Table demonstrated what this looks like. However, rather than dismiss them, we seek to elevate these voices, engage in challenging and honest dialogue, and ultimately help each other make course corrections when growing pains present a challenge. Sea to Table can take a step in the right direction by at least acknowledging the legitimate warning signs that were brought forth by fishermen and ex-employees and in addition, establish internal policies so that any future concerns are properly considered and addressed. 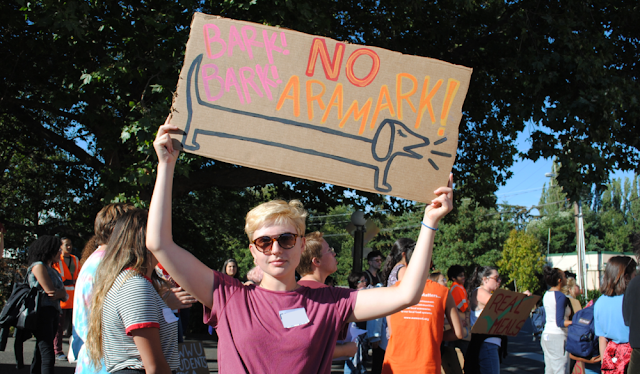 In the meantime, Massachusetts Senator Markey is calling for an investigation on Sea to Table. This type of action is one of many that are needed to bring forth solutions that will improve our seafood system. If the Senator is serious about his intent to find answers and justice, there is more than can be done. For starters, he (and others) should address the main reasons for seafood fraud which includes the current corporate consolidation of fishing rights and concentration of power along the entire seafood supply chain. These solutions can be implemented in the reauthorization of the Fish Bill (Magnuson-Stevens Act) by including limits on fisheries consolidation, incentives for improving supply chains, and more. 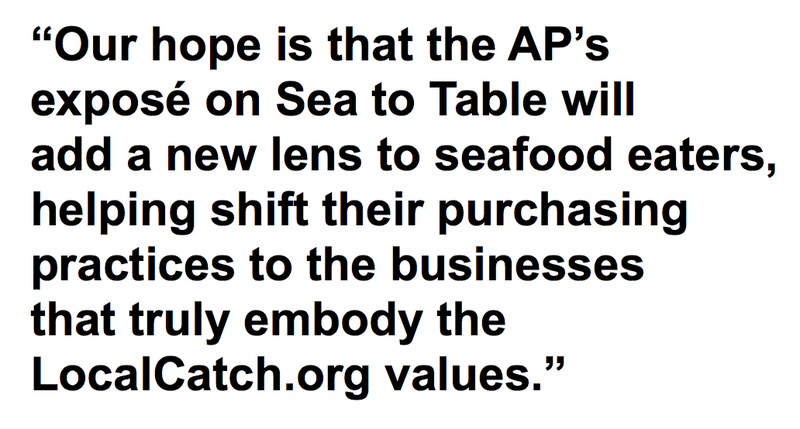 Our hope is that the AP's expose on Sea to Table will add a new lens to seafood eaters, helping the public shift their purchasing practices to the businesses that truly embody the LocalCatch.org values. As for NAMA and our network, we will continue our role in moving toward good, clean, and fair seafood. A reflection by Niaz Dorry on the process of stepping into a new role. Dorry is NAMA's Coordinating Director and as of May 1st is also the director of the National Family Farm Coalition. NAMA and NFFC entered a shared leadership model on May 1st, 2018. At the NFFC winter meeting in late February, after a long day of productive talking and planning, Farm Aid Executive Director Carolyn Mugar came up to me and said, “I have an idea and you’re not going to like it.” Hmmm… that’s an ominous way to start a conversation, I thought, but hey, it’s Carolyn. Maybe she’s going to tell me we can get a fisherman on the Farm Aid stage this year! Or the SeaFire Kids are part of this year’s line up? Or I get to smoke a joint with Willie Nelson on his bus? On the fishing front, Carolyn reminded me of how engaged everyone was during the morning session when Amy MacKown of the NAMA team discussed the Fish Bill. The similarities with family farmers’ struggles -- just on the policy level -- were enough for everyone to be nodding their heads in unison. Carolyn was right. And, honestly, I already knew that, deep down inside. Still. I had to think about this. As if my mind wasn’t already blown by the conversation with Carolyn… I hadn’t told anyone about that -- how did he know?? I turned to David with disbelief. I took the hat, and in a clownish fashion, wore it for a little while -- crying most of the time. I tried to explain the gift from David to those in the room without giving away what was really going through my mind. I didn’t tell anyone of the conversation with Carolyn. I just wore the hat. Which didn’t fit, by the way. I had to tweak it quite a bit just to get it to sit on my head properly. The day after both boards’ votes on the shared leadership proposal was cast, David called me. I thought maybe he had heard something through the grapevine? He said he was calling to see how things were going. How was NFFC doing? Have we found a new ED yet? I kept asking him if he had talked to anyone, and he said no… that’s why he was calling. He hadn’t heard anything. Kathy in the famous green hat with her husband David.